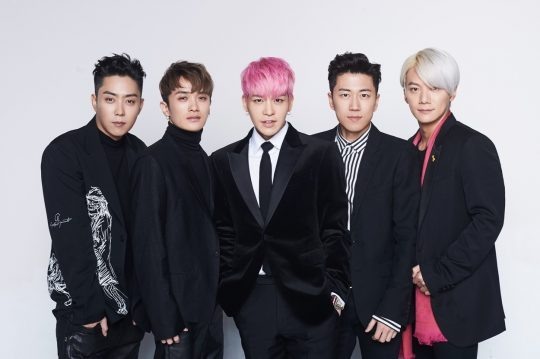 Legendary K-pop act Sechs Kies is to release a new album in September, solidifying its status as a five-piece act. YG Entertainment’s head Yang Hyun-suk uploaded a photo of himself with Sechs Kies on his social media account Tuesday. He wrote the caption in English, which reads, “Today’s Agreement New Song Release This September.” Yang also hinted that the new songs will be “epic” in Korean. Called “the first-generation idol group” here, the band regrouped in 2016 after a 16-year hiatus, dropping a new album filled with remakes of the band’s past hits. Returning to the K-pop scene with its members in their late 30s, Sech Kies has released four albums so far. Its original member Ko Ji-yong, who didn’t join the band in its return, is now off the members list, with fans protesting that he has been unjustly using the group’s name in marketing his advertising company. After criticism from fans grabbed the public’s attention last month, Ko stepped down from his position as director of the company.